US scientists have developed a hair dye that contains miracle material graphene, which allows hair to be coloured without causing breakage or frizz. A team at Northwestern University in Illinois used graphene oxide to create the dye, which changes the colour of hair to black. In their findings, which have been published in research journal Cell, they state that – unlike normal dyes, which use chemicals to cause the change in colour – the graphene-based dye is nontoxic, meaning it doesn't cause skin irritation or hair damage. "Current permanent hair dyes generate colour by doing a set of chemical reactions, right on top of your head," Jiaxing Huang, one of the scientists on the project, told Dezeen. "If not properly done, the chemicals could cause skin irritation," he continued. 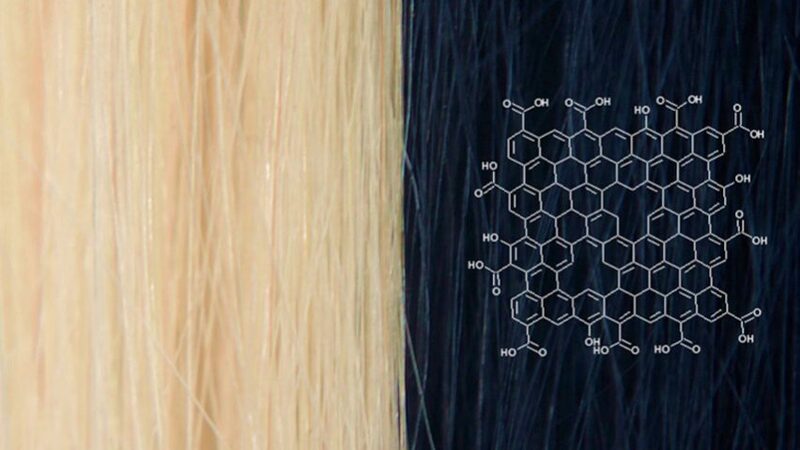 "The graphene hair dye changes hair colour by coating the hair – so it is a lot easier to do and does not use any harmful organic molecules." Graphene is one of the strongest substances known to science and boasts a range of unusual properties, for instance, it is transparent, and conducts heat and electricity. Some of interesting uses of it include for ultra-thin condoms and night-vision contact lenses. But Huang's team saw this project as an opportunity to exploit the material's adhesive qualities. "Many people have thought about graphene as the magic material for electronics and energy storage devices, such as batteries," Huang said. "But I have always seen them just as soft carbon sheets and I have always been curious about the science of these soft sheets," he continued. "Previously we discovered that these sheets can act as a surfactant, the active ingredient in soap, and they stick to surfaces well. In this work, we use their good adhesion property and brown/black colour for hair dyeing." The researchers claim the solution lasts as long as salon-standard dyes and will remain vibrant for up to 30 washes. It is applied in the form of a spray, before being brushed through and dried off. 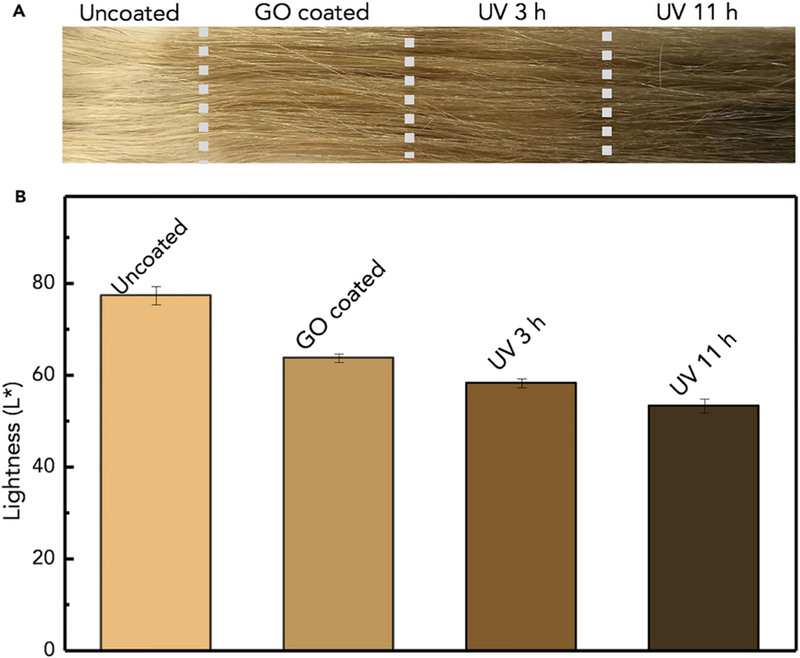 The graphene coats each hair, and gradually changes colour without the need for heat. Due to the anti-static and antibacterial properties of graphene, the dye prevents flyaway strands and keeps hair cleaner for longer. It is also able to regulate the heat emitted from the head, and even carries an electrical current – something the scientists think could be useful in the future development of humanoid robots and dermal devices. 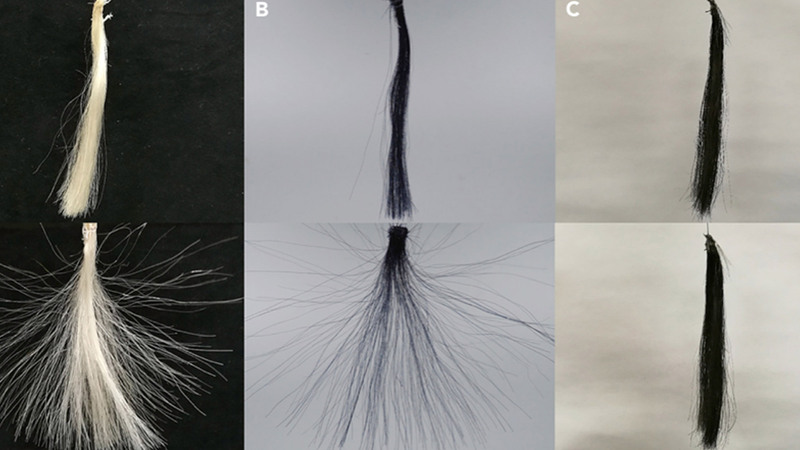 "Other than fashion and aesthetics, graphene-based hair dyes could also potentially benefit the development of electronics interfacing with the body, as well as livestock farming and the development of humanoid robots," reads the research paper. At the moment, the dye is only available in a black colour, simply because that is the colour produced by graphene. But the team said they are looking into other shades. Lighter and darker shades could be created simply through the application of less or more product. UK scientists Andre Geim and Kostya Novoselov won the Nobel Prize for Physics in 2004, after working out to extract graphene from graphite. The two-dimensional material is made up of a hexagonal lattice of carbon atoms that is just one atom thick. Other recent applications of the material include an eco-friendly paint that could improve the thermal regulation of houses and for use in water filtration.